Three people were stabbed and 13 arrested over the weekend in what is being described as a “bloody melee” between members of the Loyal White Knights of the Ku Klux Klan and anti-Klan protesters in Anaheim, Calif.
Five KKK members arrested on assault charges after the brawl were released Sunday from jail after police said a review of video showed they were acting in “self-defense,” the Los Angeles Times reports today. Seven of the counter-protesters, five men, a woman and a teen-age boy, were arrested on suspicion of assault with force likely to cause great bodily injury. The Anaheim Police Department says its investigation continues and it is looking for an unidentified man who was involved in the brawl. 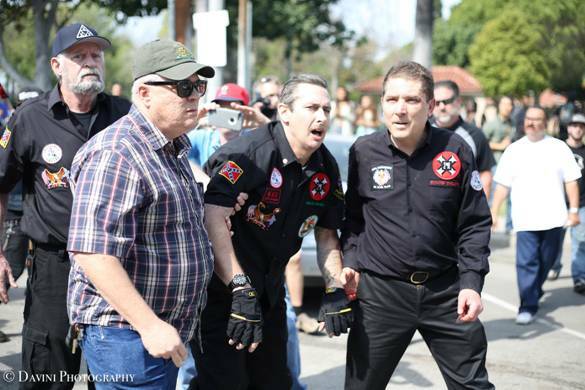 Ku Klux Klan members at a rally that turned violent in Anaheim, Calif. Photo courtesy of Heather Boucher, Divini Photography. “Anaheim is proud to draw strength in its diversity, tolerance and kindness, and Saturday’s events run counter to that,” the mayor said. The bloody brawl occurred about 12:10 p.m. Saturday when six KKK members arrived at the city’s Pearson Park for a “planned walking protest,” the Anaheim Police Department said in its statement. “Initial reports indicate a group of approximately 30 counter protesters immediately confronted the KKK group, which resulted in two KKK members being stomped on the ground by counter protesters and three counter protesters being stabbed by members of the KKK group,” the statement said. At one point during the brawl, Brian Levin, the director of the Center for the Study of Hate & Extremism at California State University, San Bernardino, found himself between attacking counter-protesters and a KKK member. "The protesters were going to tear these guys limb for limb," Levin told OC Weekly, an alternative newspaper in Anaheim. One of the counter-protesters was transported to the hospital in critical condition, but his condition later was upgraded to stable, police said. Two other counter-protesters who were stabbed are in stable condition. One KKK demonstrator was transported to the hospital in stable condition, while another suffered minor injuries and refused treatment. “Our investigators are in the process of thoroughly reviewing all the evidence from [Saturday’s] incident, including interviewing witnesses,” the Anaheim police chief said. Once the department’s investigation is completed, its results and recommendations for prosecution will be forwarded to the Orange County District Attorney’s Office.